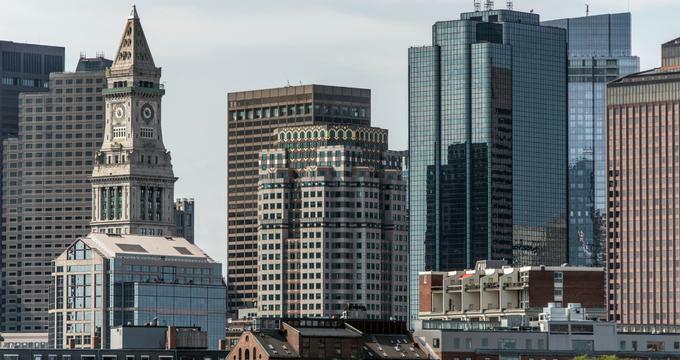 With a rich history and range of activities and attractions, Boston is an excellent place to visit. Whether you are in town as a tourist, for a business trip, for a special occasion, or even as part of your staycation, there are a long list of amazing Boston hotels to choose from. You can stay in a historic building, an elegant hotel chain, a cozy bed and breakfast, or any other type of lodging you want. The XV Beacon Hotel, which sits in the Beacon Hill neighborhood of Boston, is rich in history and in its own Beaux Arts building. There are 63 rooms in this luxury boutique hotel, known for luxurious custom amenities and peerless personal service. Each floor has seven guest rooms that are custom-designed and curated to include art commissioned for the property. Enjoy gas fireplaces, a 40- or 49-inch 4K Smart TV, and a rainforest showerhead. Expect Frette linens, cashmere throws, herbal bath salts, Italian marble bathrooms with heated towel racks, flat-screen TVs in the bathroom, three phones, private bars with premium spirits, lighted vanity mirrors, fresh flowers, signature bath amenities, individual thermostats, wireless internet, evening turndown service, privacy safes with chargers, overnight shoeshine, umbrellas, surround stereo sound, and iHome alarm clock radios. Consider a room with a sunken whirlpool tub, extra sitting area, or a suite that includes a Studio Room and Parlor Room with seating for 12 people. The on-site restaurant, Mooo…, has friendly service with classic steakhouse dishes and a regional, contemporary twist. They also offer room service 24/7. 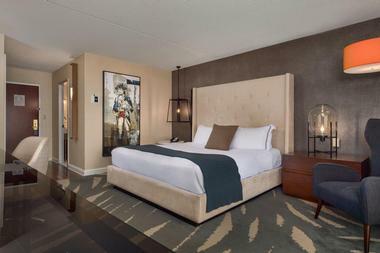 The Liberty features 298 rooms, including 10 suites, and delivers spacious spaces for guests to relax and enjoy. Rooms feature full-length mirrors, safes, smoke detectors, irons, ironing boards, air conditioning, video check-out, down or hypoallergenic pillows, down comforters, mini bars, 55-inch LED TVs with cable and in-room movies, wireless high-speed internet, phones with voicemail, desks, and wired high speed internet. Guests can also request pet beds, adjoining rooms, rooms with sitting areas, in-room massage treatments, accessibility features, and wake-up service. Take advantage of the fitness facility to get in a workout on site or make an appointment with a personal trainer. There are also boat and bike rentals, kayaks, and billiards. Stay connected with the business center and take advantage of additional guest services such as the concierge desk, tours, floral service, hairdressers, and safety deposit boxes. The hotel features six dining options, including The Yard for cocktails and light fare, Scampo for Italian, CLINK for American, and Alibi, the Liberty Bar, and Catwalk, all of which are bars. 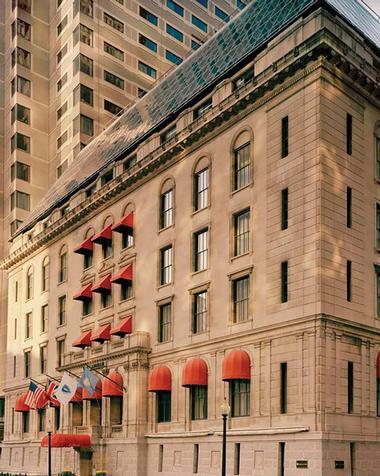 Boston Park Plaza is an historic Boston landmark hotel dating back to the 1920s that has been recently completely reimagined as part of a $100 million renovation. 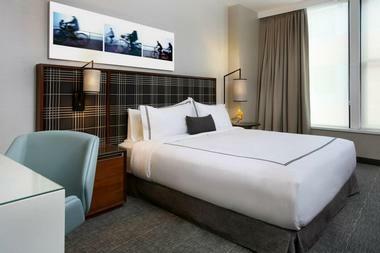 The hotel, which is located approximately six minutes on foot from the Boston Common within the city's Theater District, offers splendid guest rooms and suites with sleek modern decor and amenities such as flat screen televisions with Chromecasts, coffeemakers, minifridges, and en suite living rooms. Onsite amenities include a daily buffet breakfast, a fitness center, and a golf simulator, with business space available for corporate events and conferences. The hotel's signature restaurant, STRIP by Strega, serves up elegant steaks and seafood dishes complemented by creative cocktails. 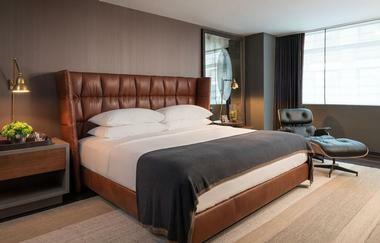 The Ames Boston Hotel delivers boutique and luxurious accommodations in a setting that is playful and refined. The building has Romanesque architectural styling sure to win over your admiration and is on the National Register of Historic Places. The 114 rooms and suites deliver chic style and modern amenities, glass and marble bathrooms, platform beds, hardwood floors, 55-inch HDTVs with premium channels, mini-bars, laptop-sized safes, black-out curtains, sound machines, cozy bathrobes, and complimentary Wi-Fi. There are also one-bedroom suites and an apartment with a decorative fireplace, powder room, dining area, and four-poster bed. If you need an energy boost, visit the hotel’s fitness center to get your daily workout in or use the bicycling facilities. Other services include laundry, valet, luggage hold, a concierge desk, and a bar area. When you want a nice meal, visit Cultivar by Mary Dumont. Or order room service for convenient dining in your room. Guests receive complimentary Breakfast in The Library, which is on the lobby level. There is a full breakfast buffet featuring sausage, scrambled eggs, and other hot items plus a la carte items such as baked goods, fruit, and cereal. For an entirely unique experience in Boston, stay at the Constitution Marina’s Unique Bed & Breakfast on Boston Harbor. These accommodations are actually bed and breakfast boats unlike anything else you have stayed in. You get the amenities of a hotel with the gentle motion of the waves rocking you to sleep and amazing sunrises over the harbor. All boats have refrigerators, wireless internet, cable TV, tea and coffee, rental bikes, and concierge services. There are seven accommodations to choose from, including options with one or two staterooms. Each boat has its own private deck, delivering amazing views and privacy. Keep in mind that the boats are spread throughout Constitution Marina, meaning you may have a walk of 300 to 1,500 feet between your boat and the main area. The staff will gladly set up boat and fishing charters or duck tours for you. Guests have access to the poolside grill where they can prepare their own meals, and the stay always includes a complimentary breakfast. The Chandler Studios deliver guest rooms with modern amenities that guests want along with independence and privacy. Instead of traditional hotel accommodations, these rooms combine the features of select service hotels with studio apartments, making them work for visits of any duration. In your room, you can make phone calls within the continental US, and all rooms include wireless internet, kitchenettes, tea kettles, coffee makers, 42-inch flat-screen satellite TVs complete with HBO, work/dining tables, keyless entry systems, in-room safes, full-size irons, spacious tile bathrooms, walk-in showers, and daily maid service. Choose from a room with a queen or king bed or one with two double beds. There is also an ADA Queen Studio and an Executive King Studio that adds a sofa with a pull-out double bed or a bedroom suite that adds Juliet balconies and the sofa bed. The property has wireless internet access throughout for convenience and connectivity. There is also an on-site fitness center for those who do not want to miss a workout while away from home. Guests are welcome to take advantage of concierge services. You can take advantage of daily, weekly, or monthly rates. 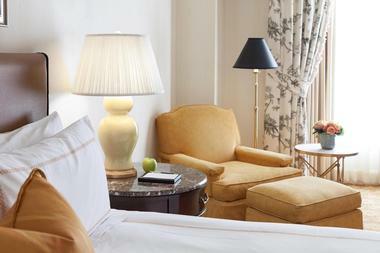 The Taj Boston has been providing guests with luxury accommodations since 1927. There are 273 guestrooms, including 42 suites with wood-burning fireplaces. Deluxe rooms include amenities such as lush fabrics, opulent tasseled draperies, luxurious beds, wooden armoires, chairs, desks, and large TVs. You can select a room with a king bed or two doubles or opt for an accessible room. Premier rooms have rich fabric wall-coverings and upholstered armchairs and sofas in addition to the other amenities. Suites add fireplaces in a separate parlor, complete with a Fireplace Butler. The staff at Taj Boston is multi-cultural and multi-lingual with staff from more than 50 countries. Dine at the Café, an AAA Four Diamond restaurant, or enjoy seasonal craft cocktails and small sharing plates with gourmet meals at the Bar. Consider the Park and Play package for valet parking. Head to the French and Adams Rooms for silver-service Afternoon Tea. You can choose a Bed and Breakfast package, in which case breakfast in The Café is included. The Encore Bed and Breakfast is in the South End neighborhood of Boston and is a 19th-century townhouse with 21st-century comfort. All of the guest rooms are spacious and include private bathrooms, showers, flat-screen TVs with cable, queen beds, Bang Olufsen sound, phones, Aveda bath amenities, hair dryers, irons, ironing boards, central air conditioning with individual regulation, and high-speed internet, among other amenities. Every room has its own character and unique furnishings. The morning starts off with a free breakfast that includes fresh fruit, granola, pastries from the Flour bakery and European-strength coffee. Enjoy your meal in the cozy breakfast nook or somewhere else on the property. The convenient location of this bed and breakfast gives guests easy access by foot to Copley Square, Back Bay, Symphony Hall, and other Boston attractions. 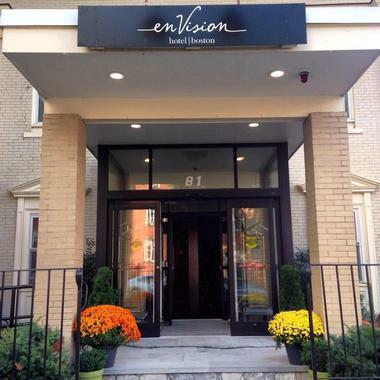 enVision Hotel Boston-Longwood is part of the Ascend Hotel Collection and gives guests easy access to all of Boston’s attractions. All guest rooms have microwaves, refrigerators, flat-screen TVs, work desks, coffeemakers, and pillow top mattresses. On weekdays, you can grab a free newspaper to read within the hotel or beyond. The hotel is also pet-friendly, although a small extra charge may apply. For convenience, the property features free wireless internet. There is a business center so you can take care of your professional needs as well as a fitness center that makes it easy to work out. Those who do not want to find parking themselves can take advantage of the hotel’s valet parking. If you need an energy boost, stop by the coffee shop. At night, attend the complimentary soiree in the lobby to meet other guests. The Four Seasons Hotel Boston delivers the luxury you expect from this hotel chain, complete with views of the historic Public Garden. The property has 273 guest rooms, a figure which includes 77 luxury suites, many of which have picture-perfect views. In addition to Wi-Fi, rooms feature thick terry bathrobes, slippers, down pillows, make-up mirrors, hair dryers, multi-line phones with voicemail, refrigerated private bars, twice-daily housekeeping and a Green Housekeeping Program, bottled water, all-news cable network, and complimentary access to more than 3,000 digital magazines and newspapers in 56 languages and from 101 countries. Residential Suites add separate living areas and oversized plasma-screen TVs. This hotel has everything you will likely need, including complimentary standard wireless internet. There are 24-hour business services, movies, and a multi-lingual concierge. If you need transportation, take advantage of the complimentary house car. Get in a workout in the fitness facilities or indoor pool, where you will also find a whirlpool. The hotel offers babysitting services, which is convenient if you are traveling with kids. Spa services are available in the private spa room or your hotel room, and you can take cookie-making classes. The Bristol serves classic fare with innovative twists and seasonal ingredients. Another option is the Bristol Bar. The Hotel Commonwealth features friendly service in a comfortable environment. The hotel is pet-friendly and even offers a treat for your pooch, pet sitting, walking, grooming, and massage services, along with complimentary pet bowls and pet bed. All rooms have imported Italian linens, Serta Perfect Sleeper pillow top beds, down pillows and comforters, plush terrycloth towels and robes, in-room fridges, flat-panel Smart TVs featuring Google Chromecast, more than 80 digital cable channels plus HBO, Apotheke luxury bath amenities, a security safe, an iron and ironing board, and a hair dryer. Guests can also request a coffeemaker, cribs, baby toiletries, and roll away beds. The entire hotel, including the rooms and common areas, features complimentary wireless internet. There is also turndown service, a 24-hour business center, valet parking, a full concierge service, laundry services, and complimentary shoeshine service. On weekday mornings, enjoy complimentary local car service. Make an in-room spa appointment or get in a workout at the fitness center. The on-site Commonwealth Shops offer boutique shopping. You can enjoy 24-hour in-room dining or enjoy a meal at the Eastern Standard with award-winning cocktails for any meal of the day. Alternatively, you may want to visit the Island Creek Oyster Bar for dinner or get a cocktail at the Hawthorne. 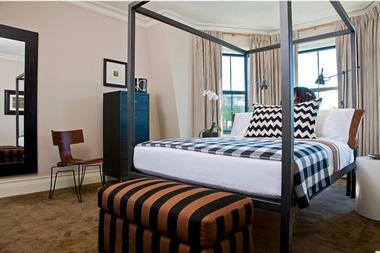 The Kimpton Onyx Hotel, located downtown, is a boutique hotel in the center of everything. The guest rooms have tailored design aesthetics with plenty of room and gorgeous desks. Choose from a Deluxe room with two double beds or a king bed, luxury Atelier Bloem amenities, luxurious linens, down comforters, and 46-inch HD flat-screen TV plus iHome sound system. The King Premier Room, on the other hand, showcases art inspired by Sherlock Holmes. While staying at the hotel, consider borrowing a bike to get around Boston in a healthy and green way, or do some yoga in your room with the complimentary yoga mat. Visit the 24-hour fitness center or book in-room spa services. If you forget something, the hotel has essentials on hand, plus full business and concierge services, complimentary overnight shoeshine, and valet parking. Relax in the evening with a hosted wine reception. You can also order room service from the Ruby Room or get a drink or dine at the restaurant/bar itself. Start your day off with complimentary tea and coffee service with organic brews. The Revere Hotel Boston Common gives guests fun accommodations with modern amenities and balconies with views of the skyline. All 365 rooms have two bath robes, hair dryers, signature pillow menus, oversized work desks, irons, ironing boards, laptop-sized electronic safes, C.O. Bigelow bath products, tea and coffeemakers, private balconies featuring panoramic views, ergonomic work chairs, and Samsung HDTVs. You can also request fridges, hypo-allergenic bedding, roll-away beds, and cribs. Cribs always come with infant baths, baby toiletries, and infant towels and sheets. Rooms can also be pet-friendly for a small fee. Take advantage of the hotel’s dry cleaning and laundry service or use the on-site parking. The facilities fee includes basic wireless internet, domestic calls, the 24-hour fitness center, an indoor heated pool, shoe shine service, the PressReader App with more than 5,000 publications, and Notary Public services during weekday business hours. Visit the Lobby Bar for a drink or order from the in-room dining menu. Visit the seasonal Rooftop Revere Bar and Lounge for amazing food with a view. Or enjoy any meal at Rebel’s Guild. This bed and breakfast is in an Italianate Victorian home in the Jamaica Plain neighborhood and was built for George Taylor in 1853. You will find a combination of antiques, thrift shop finds, and contemporary art. The spacious rooms have cable TVs, wireless internet, private bathrooms, and access to the small business center. Guests are welcome to explore the home, its gorgeous antique furnishings, and the surrounding gardens, which are perfect for a short stroll to enjoy nature or a spot to sit and read while appreciate the outdoors. Throughout the year, the inn offers visual art exhibits, jazz series, and classical concerts. The inn takes care of breakfast and offers vegan options. The bed and breakfast is just a few minutes’ walk away from other Jamaica Plain attractions, including the pond and Olmstead Park. The building housing the Bertram Inn was built in 1907 and features fireplaces, leaded windows, quarter-sawn oak paneling, and a grand sweeping staircase along with abundant gardens. The inn offers friendly service and luxurious amenities such as wood-burning fireplaces, Turkish towels, Italian linens, signature bathrobes, and workspaces complete with wireless internet. The 14 rooms all have their own unique style with options that can accommodate two, three, or four guests. Every morning start off the day with a full homemade breakfast featuring homemade granola, baked goods, fresh fruit salad, and a hot entrée that changes daily. The inn is conveniently located just two miles from the center of Boston and all the major attractions. It is also just a block from public transportation, so guests can get around with ease. 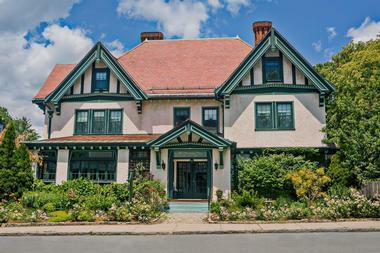 The College Club of Boston is actually the oldest college club for women in the U.S. Now, it also serves a historic bed and breakfast with 11 rooms in the Back Bay area of Boston. The club sits in a Victorian brownstone with plenty of character combined with modern amenities. Every room has a unique design created by a local designer and has been recently renovated. All rooms have wireless internet, room phones with free local calls and voicemail, elegant period antiques, individual air conditioning units, well-stocked bookshelves, desks, hair dryers, radio/MP3/CD player alarm clocks, and daily housekeeping service. Double rooms have the option of a king bed or two doubles, plus as many as two twin-size rollaway beds. These rooms all have non-working fireplaces and private bathrooms. Single rooms have a twin bed and share their bathroom with one other single. Guests are welcome to use the digital cable television in the Dining Room, plus they get discounted day passes for the Boston Sports Club. You are also able to enjoy a complimentary continental breakfast in the Dining Room in the morning. Grab coffee or tea any time of the day, and in the afternoon, pick up a complimentary cookie or two. 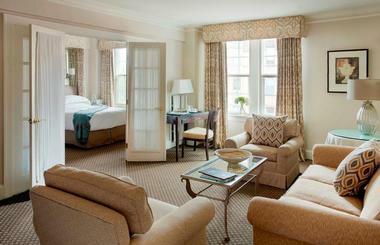 Located in Back Bay Boston, the Eliot Hotel has elegant suites and award winning personalized service. 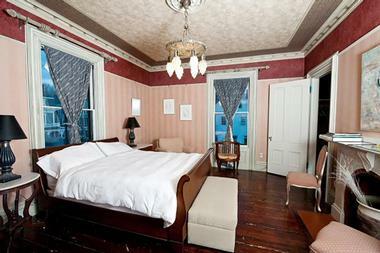 This boutique hotel is a historic home with European-inspired suites and guestrooms. All 95 accommodations have graceful ikat and linen toile fabrics, Italian marble countertops, and sumptuous down bedding in addition to plush bathrobes, complimentary wireless internet, flat-screen TVs, fully-stocked mini bars, nightly shoe shining, welcome gifts, and turndown service. Choose from a cozy guestroom or a one or two-bedroom suite. The staff at the hotel will gladly arrange reservations and tickets for nearby restaurants and attractions. The hotel’s restaurant, UNI, is nationally recognized with a Zagat-rating and overall high praise. If you want a meal during off-hours, order room service from the restaurant 24 hours a day. The restaurant opens daily for breakfast and dinner. 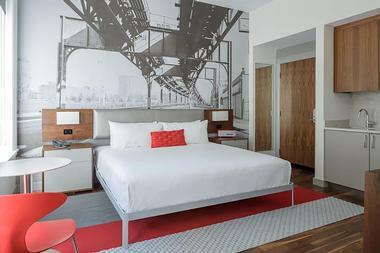 The Envoy Hotel has bold interiors and easy style, featuring suites and rooms that deliver fantastic water views. All rooms have air conditioning, living/sitting areas, hair dryers, desks, oversized chairs with ottomans, irons with ironing boards, phones with voicemail, complimentary highspeed and wireless internet, a 32-inch LCD TV with premium movie channels and cable/satellite channels. Larger rooms are also available, and you can choose from a partial or full water view. There is even the option of a one-bedroom suite with 1.5 baths. Get in your workout at the 24/7 fitness center with cardio equipment as well as free weights. Enjoy American cuisine with Boston inspiration and seasonal ingredients at OUTLOOK Kitchen + Bar, which also has micro brews and craft cocktails. If you just want a drink with a view, you can visit the Lookout Rooftop Bar, offering indoor and outdoor areas. 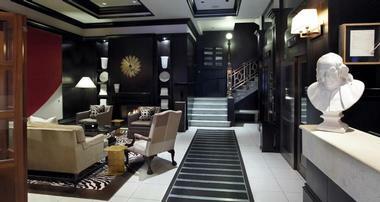 The Godfrey Hotel Boston delivers sophistication in a modernized boutique hotel with a 1908 Gothic Revival façade. Each of the rooms has 55-inch Samsung HDTVs, Frette linens, ultra-fast wireless internet, smartphone-to-TV streaming for your media of choice, BOSE Bluetooth speakers, plus Heely of London bath toiletries. There is also smartphone room entry, plush Frette robes, slippers, a desk with USB ports, valet dry cleaning and laundry, cordless phones, hair dryers, SmartFridges, digital in-room safes, surround light bathroom mirrors, irons with ironing boards, and Keurig coffeemakers. Pick a room with two queen beds or a king or opt for a corner or studio room. Guests can take advantage of the seasonally available bicycles or the 24-hour fitness center to get in a workout. There are even Running Mate Guided Tours available. The hotel offers a range of dining options, including Peruvian-Japanese dishes at Ruka. You can also visit George Howell Coffee with an espresso bar, hand-poured micro-lot and single estate coffees, and even coffee-tasting “flights.” If you don’t feel like stepping out, order room service from RUKA. 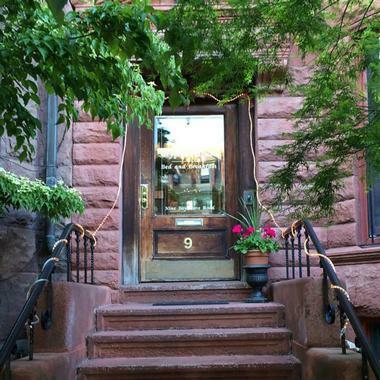 The Gryphon House is a bed and breakfast in a luxurious turn-of-the-century brownstone located within an easy walk of many Boston attractions, plus public transportation. Every suite has a queen-sized bed, air conditioning, a gas log fireplace, a large private bath, HD TVs with HBO and DirecTV, DVD/tape/CD players, wet bars with fridges, voicemail, two-line phones, and high-speed wireless and ethernet. Most rooms have both tubs and showers and guests can borrow DVDs from the extensive free video library within the lobby. Rooms also have coffeemakers, teakettles, and toasters. After enjoying your free breakfast, step outside the building and walk to Newbury Street for some shopping or head to Kenmore Square for the T stop along the Green Line to visit nearly anywhere in Boston. There are also occasional specials available, such as discounts on Red Sox tickets with a reservation. The Kimpton Nine Zero Hotel is located downtown and was recently renovated to deliver the latest modern amenities in a chic boutique hotel. Choose from one of the 190 guest rooms and suites and expect Eames lounge chairs, plush leather bed frames, artfully curated accents, and in-room workspaces. Some rooms offer two queen beds or a king bed and the option of a skyline view. Suites add in separate dining and living areas, with the option of a spa bath with a jetted tub. The hotel has bikes available for guests to use while exploring Boston, and every room comes with a yoga mat. You can also visit the 24-hour fitness center or book an in-room spa service. Take advantage of available valet parking and full concierge services. Other amenities include same-day dry cleaning and laundry, complimentary overnight shoeshine, a 24-hour business center, a complimentary morning paper, and ADA accessibility. A delicious European breakfast is included in the room rates, as is morning tea and coffee service in the 2nd floor lounge. Every evening, there is a hosted wine reception in the lobby. Visit the Highball Lounge, the hotel’s cocktail bar for a drink and meal with a DJ. The Inn at St Botolph delivers all-inclusive accommodations that let you live like a local while staying in Boston. The large suites feature fully equipped kitchenettes so you can prepare your own meals. The entire property has wireless internet and there is keyless entry with video intercoms. The inn can also personalize your stay with ease, and you can even personalize your housekeeping. Rooms also feature deluxe bedding, gas fireplaces, and 42-inch flat-screen TVs. Choose from a Studio Suite, One Bedroom Suite, One Bedroom Ground or Deluxe Suite, or Two Bedroom Executive Suite. Take advantage of the on-site business center or get in a workout at the fitness center, also on site. There is an iMac computer with printing capabilities in the lounge. Relax in common areas like the lounge and take care of your dirty clothes with the self-serve laundry. Begin the day with the complimentary continental breakfast. There is DAVIDs tea and Nespresso coffee available throughout the day, along with snacks. For other meals, guests can receive a discount certificate for nearby restaurants. 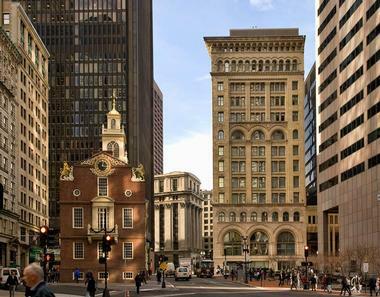 The Langham sits in the former Federal Reserve Bank of Boston, combining 1920s Renaissance Revival styling with classic interiors and modern amenities. There are 317 rooms and suites in the classic style with views of Norman B. Leventhal Park at the Post Office Square, the skyline, or the Financial District. Choose from nine room types, all of which at least include 37-inch flat-screen LCD HDTVs, business desks, laptop-sized safes, tea and coffeemakers, complimentary Wi-Fi, refrigerated private bars, iHome docking stations, Signature Blissful Beds, Italian marble bathrooms with Chuan Spa amenities, plush robes and slippers, twice daily housekeeping, 24-hour private kitchens, and access to the PressReader e-newspaper. You can also request a complimentary newspaper. Stay fit at the hotel’s fitness center or pool or visit the Chuan Spa to get pampered with spa treatments that have their inspiration in Traditional Chinese Medicine. Enjoy contemporary New England cuisine at Café Fleuri where meals are made with market-fresh, locally sourced ingredients. Savor modern American dishes and handcrafted cocktails with a 25-foot vaulted ceiling featuring crystal chandeliers at BOND. You can also reserve a spot at The Reserve for the Langham Afternoon Tea with Wedgwood. Another option is dining at the Langham Supper Club, the Saturday Chocolate Bar, or the Sunday City Brunch. 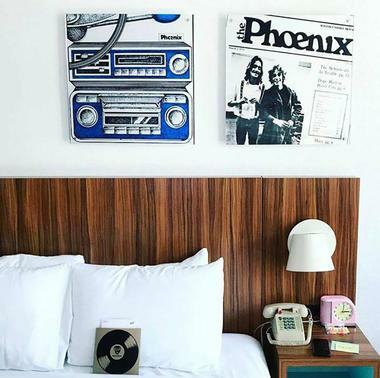 The Verb Hotel is inspired by music, featuring Rock and Roll artifacts throughout the property, taking you back to the 1960s and 1970s. To keep the theme going, all rooms have record players and earplugs. Consider a room with a balcony in addition to the king or two queen beds or opt for one overlooking the stadium or pool. There are also standard rooms that have irons, ironing boards, mini fridges, wireless internet, Keurig coffeemakers, 100% cotton plush bedding, safes, air conditioning, bathrobes, hair dryers, free local calls, bath amenities from C.O. Bigelow, flat-screen TVs with cable, and work chairs and desks. There are even windows that actually open and blackout blinds. Take advantage of the seasonal outdoor pool to cool off during the warmer months. Don’t forget to check out the iconic Bus, which has its own rich history and is located on the property. Guests also have complimentary access to the nearby Boston Sports Club, with classes, a steam room, sauna, and more. Dine at Hojoko, the on-site restaurant in the Japanese tavern style. 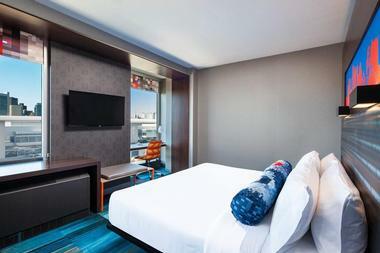 Aloft Boston Seaport district is within Boston’s thriving Seaport district and just minutes from the airport. It is filled with all the amenities you need, and it is also dog friendly. Choose from a room with a king bed or two queens and enjoy amenities such as an ergonomic workstation, fast and free Wi-Fi, free coffee and bottled water, a mini-fridge, a rainfall showerhead in the walk-in shower, a 42-inch LCD TV, and Bliss spa amenities. The Savvy Rooms add some extra space, or you can choose an ADA room. The Voice-Activated Hotel Room is unique, using an iPad with a customized Aloft app that lets you control lighting, streaming, and more with Siri. Get in your workout at the Re:charge gym, which is open 24/7. Or visit the Splash pool, an indoor saline pool. The Lawn on D is the hotel’s front lawn and has food and drinks, live music, and yard games. No matter the time of day, you can get a light grab and go meal at Re:fuel by Aloft, which has a chef attendant on hand in the mornings. Get a drink at W XYZ bar, which also has a full menu and live music at times or play pool with a drink at the Re:mix lounge. 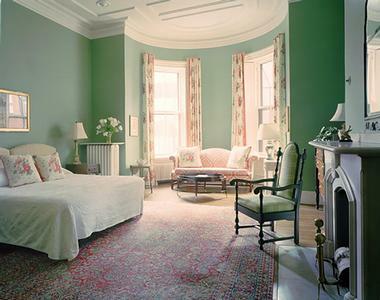 Within the South End, Clarendon Square Bed and Breakfast is a boutique hotel as well as historic bed and breakfast. The six-story townhouse features spacious suites and guest rooms, including Interior Queen rooms, Deluxe Queens, and Luxury Suites. All accommodations have luxurious bath amenities from Fresh Skincare, designer bedding, and premium Frette bathrobes and linens. Interior Queens have romantic lighting, crystal chandeliers, flat-panel TVs with cable, down pillows and duvets, fast wireless internet, hair dryers, irons, and private tile and limestone baths. Deluxe Queens add comfortable sitting areas and the Luxury Suite is apartment-sized and includes a large TV, a full living room, sofa, desk, lounge chairs, dressing room, soaking tub for two people, and walk-in shower. Head up to the hotel’s roof to relax in the hot tub while enjoying the Boston skyline or sit in one of the other public areas such as the rooftop, library, or parlor. There is also a Garden Terrace open in spring, summer, and fall, where you can sit surrounded by herbs and flowers. Begin the day with a European continental breakfast with indulgent and healthy treats plus espresso and coffee and a range of locations to dine.